MD Norm Tucker says the new $1 million sealed quench furnace adds a new dimension. HEAT Treatment Australia can now process payloads up to a tonne in weight, and large scale parts, folowing the installation of a new sealed quench furnace at its Coopers Plains headquarters in Brisbane. Ideal for meeting the requirements of mining industry equipment, spare parts and gear suppliers, the $1 million furnace operates with the aid of powerful computer software 24 hours a day 7 days a week. 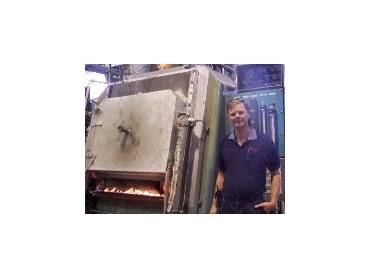 Heat Treatment Australia managing director Norm Tucker said the furnace had exceptional quality control characteristics with no rejects in 200 days of operation to date. An operator loads the baskets into the furnace, selects a pre-defined program, and the furnace does the rest. It caters for individual parts 800mm wide, 1.2m long and 600mm high. Long parts of large diameter remain flat and stable and small parts can be hung in individual racks separated from each other. This results in straighter and more uniformly processed parts than previously achievable. Heat Treatment quality manager Gary Coffey said the new furnace would increase capacity at the Brisbane facility by more than a third. "Customers will benefit from its excellent process control and the repeatability of the cycle through computerisation," he said. * Hardening and tempering of cold working tool steels. Mr Coffey said Heat Treatment Australia operated a fully approved quality management system under ISO 9001:2000. The company is also accredited to CASA and NATA standards. The company's in-house laboratory is able to conduct effective case depth examination using microhardness testing equipment. This enables confirmation of the case depth achieved and ensures it matches the customer specification. The most stringent automotive process specifications can be verified using the facilities of the fully equipped on site laboratory. The furnace - the first of two to be installed - was bought by Heat Treatment and modified in-house to suit its requirements. This entailed construction of a new building, new overhead crane equipment, and underground work to house the installation, which generates temperatures up to 1000°C. The country's largest heat-treating service provider in terms of geographic spread, Heat Treatment Australia has plants in Sydney and Melbourne as well as Brisbane. Norm Tucker said that by maximising capacity the company expected to provide faster turnaround and highly competitive pricing for its customers. "We are very excited by the quality offered with our new system that operates virtually without human influence," he added.